As of v7, the handling of galleries has changed (see here for v8.0+). All galleries, once created, are saved and displayed in the new gallery pane. In Windows this shares the side of the main application window with the Folder Sync pane. 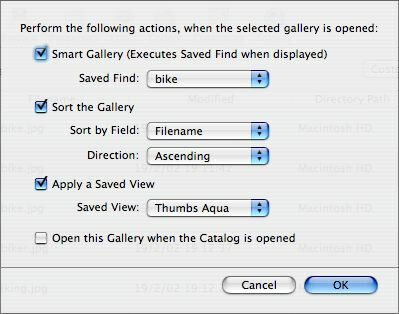 On the Mac, the galleries are listed in a pane that can be opened or closed from the left side of a gallery window (note - only the first-opened gallery window of a session. Create a new untitled gallery. You have the option to name the gallery when it is created. Deletes the selected gallery. 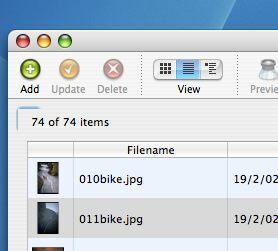 Deletes the currently selected gallery (but not the records in it). Opens the selected gallery in a new window (Mac only). Clicking a gallery causes the current window to show the new gallery's contents. Click this icon or double-click the gallery to have it open in a separate window. All Items. This is the default gallery displayed on start-up, if no other galleries are set to open at start. It holds all items in the entire catalogue. Last Find. This holds the result of the last Find carried out in the current session. Each Find replaces the previous contents so to compare 2 Finds you must save the result of the first into a user-created gallery. Although listed third in the list, this gallery is not displayed at all until a Find is run in the current session (a little confusing!). Galleries ('tryout' gallery above). 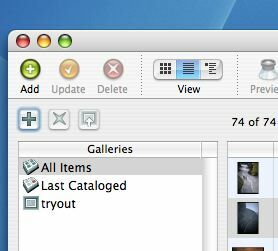 User created galleries, either named or 'Untitled' as in v6. Note that as Publisher or higher level is needed (as in v6) to create galleries, Reader/Editor level users can use only the galleries already existing in the catalogue. This is an oversight which is likely to be corrected, allowing Reader/Editor the ability to create untitled galleries that don't persist beyond the end of the session. Smart Galleries ('bike' gallery above). These are user-created galleries which have saved Finds applied, so that opening the gallery always runs the search to ensure the record set is up to date. In contrast, normal galleries hold the records listed in them when the gallery was last saved. New. Creates new gallery, like the icon. Save As... allows a new untitled gallery to be saved with a new user-set named (you can't rename the three built-in galleries). Settings... 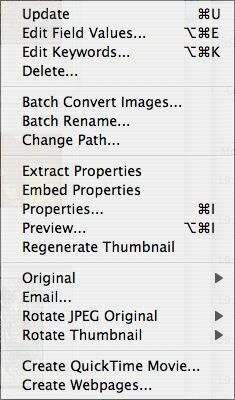 Opens the settings dialog (below). Only applies to custom galleries. Smart Gallery. Select a Saved Find to be run whenever the gallery is opened. Apply a Saved View. Apply any Saved View from the current catalogue when the Gallery is opened. Open this Gallery when the Catalog is opened. This gallery will open at start-up, in addition to the 'All Items'. This shows the standard set of controls. 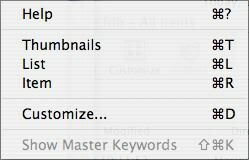 Customise the toolbar to alter/increase the buttons shown. The two drop-down lists give access to all saved views and all fields allowed for sorting.